We ate an excellent breakfast at a small restaurant in town this morning. Auke showed up late due to a flat tire which occurred overnight – his first since the two he had in Tucson. It was odd because he thoroughly cleaned his bike, tires included, just yesterday. After eating, we climbed Stunner Pass. It was slow for me – riding with a full stomach isn’t comfortable. Part of the way up the pass, I stopped to take a picture of the valley in which Platoro resides. We descended the opposite side of Stunner Pass into the shade of the mountain. I was chilled after working up a sweat climbing. As we lost altitude, a mountain with eroded sides, exposing colorful oxidized minerals, came into view. At the bottom of the descent we crossed a river and immediately began climbing again. I rode ahead while Mathieu waited for Auke, who was taking pictures of the colorful landscape. The caught up and overtook me very soon. 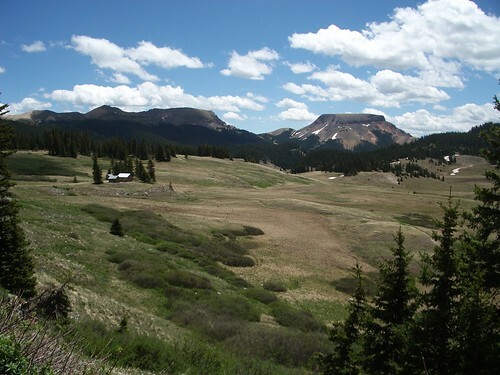 We would meet again near Elwood Pass – 10 miles (almost entirely up) ahead. I could not get into good rhythm, so I found an alternate means of keeping my legs turning. With 6 miles to go, I stopped for a small stack. I ate one Oreo from a pack of 6 that I bought in Platoro then kept riding. I told myself I would eat one cookie at each mile mark until Elwood. This turned out to be a bad strategy as I watched the odometer slowly increment. Sometimes I would not look for a while, and then guess the mileage. Often I would guess a higher number than my actual distance, making it seem even longer of a climb. Just before Elwood, woods gave way to a high open meadow. The Texans had camped here the night before – they were cold the entire time and were nearly blown off the mountain, they said. When I arrived (fashionably late) at Elwood, I snacked and rested. 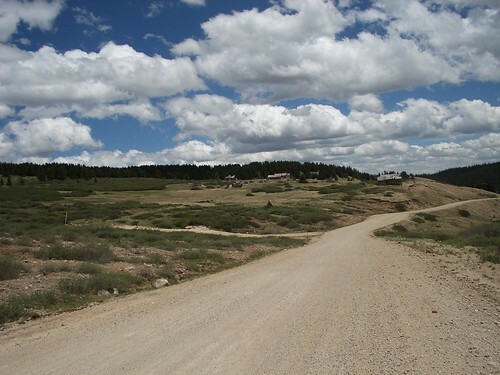 After a few minutes, we were riding again, this time to Summitville – an abandoned mining town. 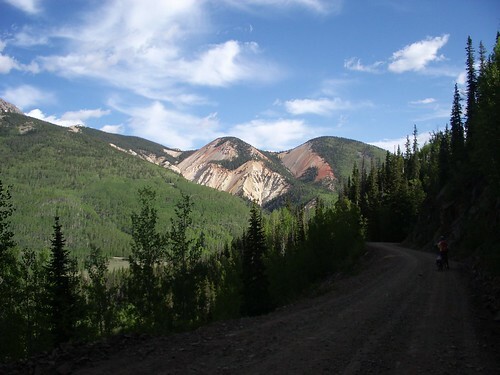 The mine now leaks heavy metals and toxic chemicals into the surrounding streams. On the way there, Mathieu’s tire went flat. I stayed behind to offer moral support as he replaced the tube. He sure picked a bad place for a flat – very cold and windy! Afterwards, we rode on toward Summitville. Within a few miles, his tire went flat again. This time Auke was there, so I rode ahead up a steep climb which leveled out at Summitville. The town wasn’t quite as abandoned as I expected. People were working to clean the mine’s toxic runoff. 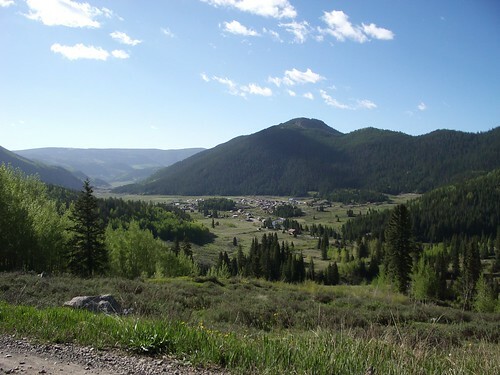 Past Summitville we had a 5 mile climb to Indiana Pass. 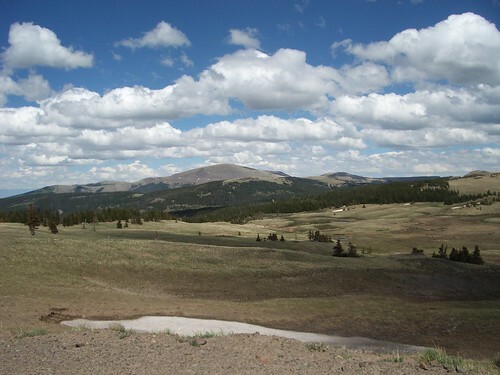 At 11,910 feet, it is the highest point on the Great Divide. The first half mile was extremely steep. I dismounted the bike and pushed up this section. Things didn’t get easier for me even after the grade became rideable again. Maybe it was the altitude. Maybe it was something I ate. I felt dizzy and nauseous. 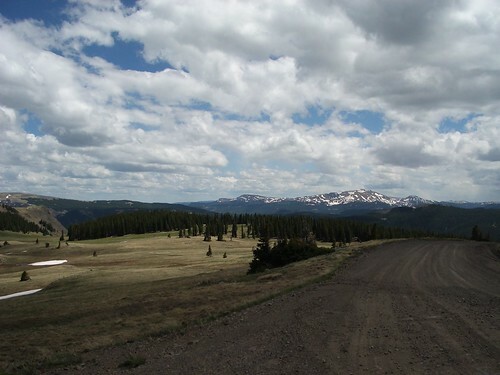 I alternated between riding and walking often on my way up to Indiana Pass. Then finally, I saw the top! I got back on the bike and tried to convince myself to ride the final half mile without stopping. I didn’t go too far before stopping again. As I rested, gathering strength for a final push, a hunter drove by. We talked for a while about the trip and the route. He seemed very impressed and told me his son is a Navy Seal and the toughest guy he knows…and he wouldn’t be able to what we were doing. Before driving away, he asked if I was hungry. “What do you have?” He gave me a bag of trail mix! When he left, I stood and ate handfuls of mix, reflecting on what he said. Now I was motivated to finish the climb without rest. And I did. The actual top was anti-climactic. There were no markers or signs indicating the pass. Nothing but cold wind, snow drifts, and sparse trees. I took some pictures, a short video, then began descending. The hard part of the day was over. All that was left was 25 miles to Del Norte, which was 4,000 feet below where I stood. After a few miles of coasting downhill, I met up with Mathieu and Auke. As I ate lunch, storm clouds started coming over the mountain we just conquered. That ended my meal quickly. I put a rain jacked on and began descending with the others. In an every-man-for-himself style, Del Norte was our next meeting point. It started raining, lightly at first, and then harder. I stopped to put rain pants on. As I did, Auke passed me. The road was loose gravel, which is hard for Mathieu with his trailer. Going down the road, I could see tire marks in the gravel. 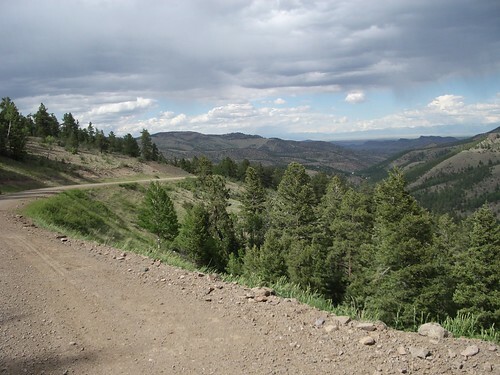 At the turn of a switchback, I saw tire marks leading straight into an aspen stand – like someone forgot to turn. I slowed, expecting to see Auke and his bike in a messy heap. I did not, though. Inspecting further, I saw that right at the edge of the road, the tracks made a sharp turn heading down the switchback. Auke had stopped at the edge to take a picture. As I continued downward, the temperatures rose and the rain subsided. Gravel turned to pavement for the last 10 miles, which made fast riding easier and safer. Right where the route entered Del Norte is a coffee shop/grocery store called the Organic Peddler. On the roof was a bicycle, so we decided this was a good place to wait for Mathieu. It was a very hippy-ish place. The people working in the shop knew about the route – lots of riders have stopped for food and drinks in years past. Mathieu arrived unusually late. 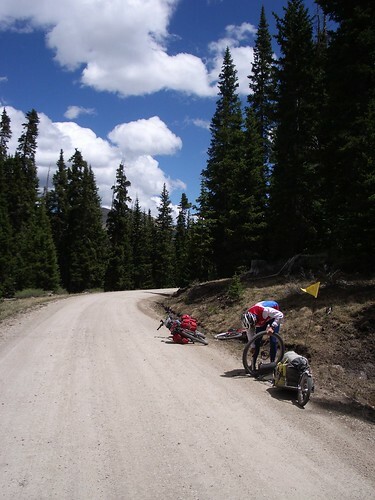 He had mechanical problems with his disc brakes – not good on a 25 mile gravelly descent. We started thinking of where to spend the night. The Organic Peddler had a small cabin/house available. Rain was coming soon, so we took it. As we hauled our gear inside, it started pouring. After the rain stopped, we rode through town to find Gary Blakely – a guy who offers basic bike repair and sells some spare parts. I bought two new tubes to replace some of my patched ones. Afterwards, we stopped at Subway for dinner. While eating, the Texans rode in and joined us. They are camping in the local park tonight. It looked like more rain and wind was in the forecast, so I was happy to be inside. The ride back to the Peddler wasn’t fun. It was cold and windy. The cold soda I drank with dinner didn’t help either…nor did the rain that came upon us. Before going to bed, Auke reminded us of the dilemma we faced. For him to photograph the national parks, we would have to up the mileage or take paved shortcuts. 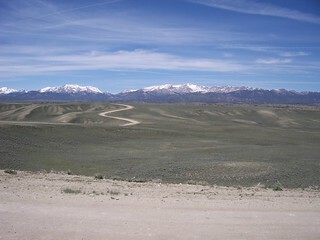 We decided to ride 80 miles on pavement to Salida tomorrow. It would bypass 3 days of on-route riding. I slept well (on a cot mattress on the floor) knowing Indiana Pass was tackled. Afterall, it’s all downhill from here, right? This entry was posted in Journal on August 23, 2010 by dave.